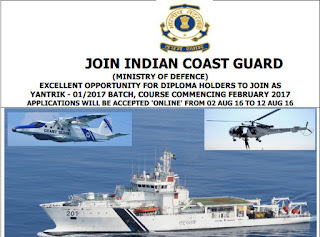 A dream job from Ministry of Defence in Indian Coast Guard for Diploma Holders. Apply online for 01/2017 batch and course will commencing in February 2017. 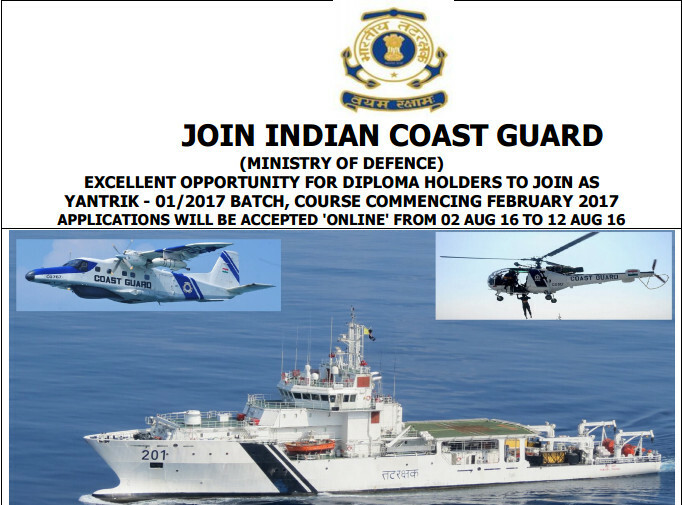 Pay Scale :- After joining Indian Coast Guard candidates will get pay scale Rs 5200 - 20200 along with Rs 2400 Grade pay. Education requirements :- Candidates must passed Matriculation or equivalent examination and diploma in Electrical/Mechanical/Electronics and Telecommunication (Radio/Power) Engineering with 60% in aggregate. Age limits :- Minimum 18 years old and maximum 22 years old candidates can apply online and 5 years age relaxation for SC/ST candidates.